Shooting games? They aren’t really my favorite type of app. I’ve never been a card carrying member of the NRA nor will I ever be one. And usually when a shooting game comes up in queue that I have to review, I don’t exactly become super excited. So when I tested Sunstorm Interactive’s shooting game, Trophy Hunt, I was really surprised. This classic, point-and-shoot hunting game is appealing for shooting and nonshooting fans alike–unless you absolutely hate the idea of hunting animals (real or otherwise). Trophy Hunt is a continuation of Sunstorm Interactive’s popular release Real Deer Hunting. The game promises an ultra-realistic hunting experience for players who want to hunt prized big game animals of North America like elk, Bull Moose, Grizzly Bears, and Big Horn Sheep. You’ll use different weapons like the 7mm Rifle, 300 Mag Rifle, 44 Magnum Pistol, and Compound Bow to hunt down these animals. Once you hunt them down, you can even collect their heads for your trophy room. Playing is easy enough. You’ll select your desired weapon and pick a region of the rocky mountain west: Colorado, Utah, Montana, Idaho, or Wyoming. At first you’ll be restricted to certain regions, but after you develop your skill you can unlock other areas. While hunting, you’ll be presented with a beautiful landscape with animals hidden here and there. 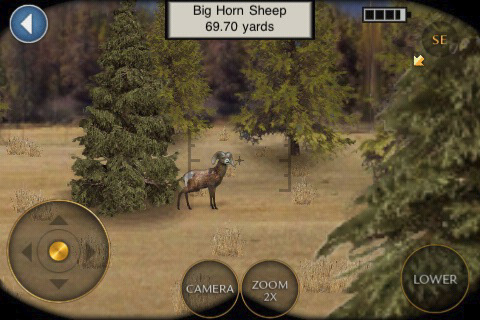 Press the joystick control to move your binoculars and locate an animal you want to hunt. Then simply touch another button to raise your gun and fire. Other features include the ability to raise an elk call to attract animals; sound the elk buggle to simulate being an aggressive male; mimicking a hurt animal to attract hungry bears; and the cover scent option to mask your smell from animals. The game comes with easy to understand, complete instructions. Overall, controls are intuitive. There’s a d-pad you press to make up/down/left/right movements and other buttons you press to turn on or activate the other features. What adds to the realism is the ability to adjust sensitivity of the joystick or screen drag type. You can adjust the amount of movement you achieve when aiming. I also appreciated the option of selecting your desired screen type from three different options. Other nifty features include the ability to share your victories with your friends–an e-mail feature is built right in. As for the audio, you’ll experience the sounds of nature which really enhance the gameplay experience. There’s no inappropriate soundtrack–just birds chirping, winds blowing, and the sound of almost silence. It’s highly suitable for this kind of shooting experience. Developers also offers a realistic hunting experience with great, photorealistic graphics and animation. You’ll see various locations under various weather conditions. The game is great as is, but developers might consider a few tweaks. Firstly, including online leaderboards or integration with OpenFeint certainly wouldn’t hurt. Including additional animals, weapons, locations, and backgrounds would also be great. Also, incorporating stats about the animals weights, sizes, and distance (from player) would create a more realistic experience. That way, users will have to strategize and choose the best weapon for the kill. Overall, this shooting game is a perfect break from traditional first person shooter games and it offers an excellent value. There’s a lot of replay potential. You’ll play at your own pace and have something to show for your efforts. And at $1.99, it’s quite a bit cheaper than what a gun license will cost you. AppSafari review of Real Trophy Hunting was written by Linda Ta on May 11th, 2010 and categorized under App Store, First Person Shooter, Fun, Games, Maps, Sports. Page viewed 6955 times, 3 so far today. Need help on using these apps? Please read the Help Page. I’ve tried it and its ok, there is another similar game called just Trophy Hunt, and I think I like the graphics on that one better.